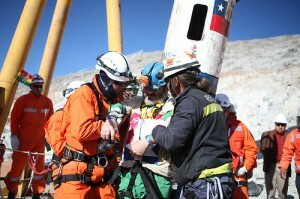 Chile is crocking up to be the destination of choice for those who want to be rescued. Already, several of the big discount travel companies, along with some of the more upscale packagers who book trips to exotic locales like Borneo, are ramping up for the expected influx of tourists who want to go through the experience of being buried alive and removed from their underground prison through a tube. The attraction of such adventures, like the old Mt. Everest treks that created so much attention in the past, is that immersion in a near-death travel experience creates international celebrity. The Times reported that the diarist of the trapped miners will undoubtedly have a career as a writer, and the lone Bolivian was offered a new position by his country’s president Evo Morales (which the Times reported he had already rejected). Still another of the miners apparently walked into the arms of his mistress rather than his wife, undoubtedly making him a candidate as a heartthrob on the Chilean soaps. One of the problems that travel companies are wrestling with is exactly how to pull off the entombment, now that a rescue template has already been created. Will travelers be brought to places in Chile where the fault lines are more conducive to earthquakes? Will they be asked to sign up for jobs in mines that have either failed inspections or for which corrupt inspectors have been paid off to overlook potentially dangerous conditions? These and other details need to be worked out, but the next story about a Chilean mine rescue is more likely to appear in the Sunday travel section, under the headline “When Down Under is Not Australia,” rather than the front page, as the Chilean rescue saga did ("33 Miners Are Out, Defying Dire Predictions on Fitness and Spirit," NYT, 10/14/10). If I didn't know better, I'd say that Life has a macabre sense of humor -- but I do, & it's actually humanity that has the sense of the macabre. You didn't mention Billy Wilder's brilliant 1951 film, THE BIG CARNIVAL, in which Kirk Douglas plays an unscrupulous newspaperman who exploits the story of an Arizona mine rescue, quite literally turning it into a three-ring circus. For aspiring publicists & promoters who wish to exploit the after-market of the Chilean mine rescue to the maximum, the movie is a godsend. It can serve as their blueprint & guide to squeezing every last peso & dollar out of the most exciting news story so far this year. thanks Peloni and great to hear from you. Yes, there will undoubtedly be gold neck chains which will allow models of the cylinder to hang from folks' necks. This is a non sequitur that has nothing to do with your Big Carnival citation, but do you remember a film called The Killing?